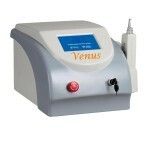 The Venus Eraser Q-switched Nd:YAG lasers are effective for removing both amateur and professional tattoos. They can remove many colours of ink. Our Q-switched laser machines emit pulses that last only a tiny fraction of a second, powerful enough to heat the tattoo dye and shatter it but not long enough to damage the skin. Most of our machines can operate on two wavelengths – 1064nm and 532nm. This is the Gold standard of tattoo removal. The 1064nm wavelength is effective at removing many black, blue, and tattoos. At the halved frequency setting of 532 nm, this laser is highly effective for treating red, brown orange and some yellow tattoos. Our really large machines can operate on four wavelengths -1064nm, 650nm, 585nm and 532nm. These provide the ability to remove a large range of colours. The Venus Laser Erasers also have the advantage of being particularly effective for darker skinned people. Although a laser can produce the right wavelengths of light, without sufficient power and time, the desired effect will not be achieved. Tattoo dyes can be difficult to break down, and only recently have lasers been able to produce sufficient energy to achieve the expected results.